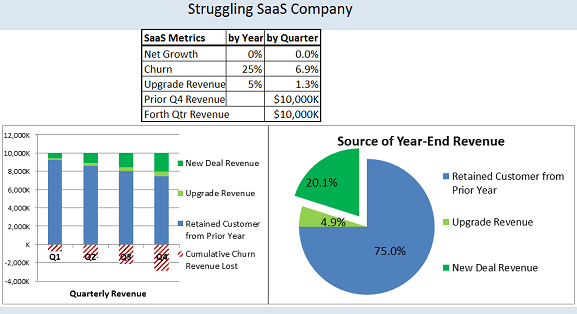 The primary financial goal of SaaS companies is Profitable Growth. That requires retaining existing customers and adding new sources of their SaaS revenue while keeping costs down. The focus of revenue generation is often placed on new customer acquisition, but to maximize revenue, the focus should be much broader. The revenue derived from new customer sales after the initial customer base is established is just a fraction of the total SaaS revenue. The most successful SaaS companies derive a substantial portion of their growth from upselling into their base while minimizing customer defections (churn). World Class SaaS companies astutely allocate resources to maximize revenue from the customer base proportional to their value to the company. 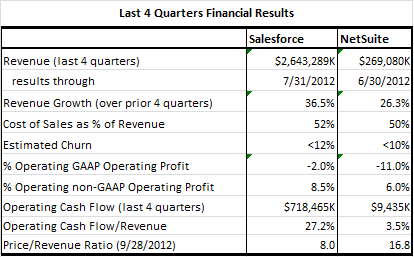 Salesforce and NetSuite are two instructive models of profitable growth for SaaS companies. Both companies have impressive growth, generate a positive cash flow, and both have a positive (non-GAAP) profit (excluding non-cash items such as stock option expenses). Successful SaaS companies model the approach of Salesforce and NetSuite and attack revenue growth through three avenues: 1) Acquisition of new customers, 2) Expansion of existing customers (upsell), and 3) Retention of existing customers and their SaaS revenue. 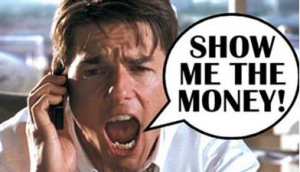 Customer Success Software vendor Totango recently 150 SaaS executives and found that the average incremental revenue from B2B customers as of the end of the prior year is about 25% of their prior year’s revenue (note this is only for those customers who do not churn). 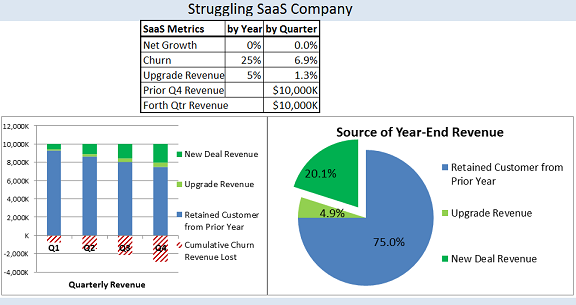 A “Struggling” SaaS company with 25% annual churn and 10% incremental revenue from the customer base must generate 15.2% of the prior year’s total revenue from new customer sales, just to keep the same revenue as the prior year! The example below has 84% of this year’s SaaS revenue generated from their customer base as of the prior typical for SaaS companies, but inadequate to achieve “World Class” status. The Struggling SaaS company must generate 36% more “New-Name” sales (15% vs. 11%) over the prior year just to keep the same revenue. During early years of SaaS, there is a limited base to grow so the revenue must primarily come from new customers until the SaaS “revenue flywheel” builds from the customer base. But this base can only be expanded if it sticks around. Once the SaaS company moves beyond the launch phase, resources should be appropriately allocated between new customer acquisition, growing the base and retaining customers. Obtaining new customers is essential to increase the number of customers that can be grown, ideally driving the revenue for each customer over the life of the customer. Customer retention is obviously critical since a lost customer not only needs to be replaced with a new one, but it is likely to be negative to the company’s reputation. With user communities building around SaaS products, SaaS problems that resulted in churn will show up in the community damaging the company’s reputation and impeding its ability to attract new customers. Additionally, customer referrals are an important source of new customers which is lost when a customer churns. World-class SaaS companies will allocate resources optimally between new customer acquisition, growing existing customer revenue, and reducing churn. When a relatively small fraction of the revenue comes from New-Name customers, the company resources should be applied to those areas with the greatest revenue generation potential. Retention improvement programs can be financially justified by comparing the cost of replacing a dollar of revenue lost though churn with New-Name sales. Retention programs should have churn reduction objectives that justify their expense – the ROI on these programs can be excellent with the added benefit of increasing the company’s reputation by increasing customer satisfaction helping drive new customer sales and facilitating upselling the customer base. Many of the actions to grow revenue in the customer base and reduce churn are intertwined. There is an increased interest in Customer Success shown by the emergence of Customer Success Managers, and VPs of Customer Success. 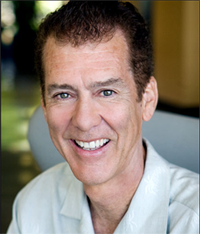 Workday’s founder has the title of “Co-CEO and Chief Customer Advocate”. The most successful cloud companies today have a focus on the customer success resulting in higher upselling revenue and lower churn. By analyzing customer engagement from multiple sources, an action plan is developed and real-time action is taken. Customer engagement tools such as those provided by Totango and Gainsight help identify patterns of usage that portend either upselling opportunities or churn risks. These tools also provide both automated messaging directly to the customer or notify the SaaS company Sales and Customer Success personnel about actions that should be taken such as additional training or sales contact. The best SaaS companies maximize their revenue growth and minimize the cost of growing their revenue by optimizing three revenue sources: 1) New Customers, 2) Incremental Sales to their Customer Base, and 3) Retaining the Customer Base. Those that focus primarily on new customer acquisition will have to drive a high level of new customer sales just to stay in place. It is much more expensive to replace a customer than to retain them, and it is much more expensive to sell a new customer than expand a happy customer. The best SaaS companies will put measures in place including a vigorous customer success program, continually seek feedback from their customers on how they can help them be more successful, and analyze their churn to take steps for both the individual customer and to minimize the systemic reasons for their customer churn including improving both the services and products offered by the company. These companies also stay close to their customers both by monitoring interactions with their customers and monitoring their customers’ use of the system to expand the revenue from their SaaS offering within the customer base.